Can a song become a children’s picture book? John Schumann, songwriter, poet, singer and musician wrote about the Vietnam War in his song I Was Only 19. 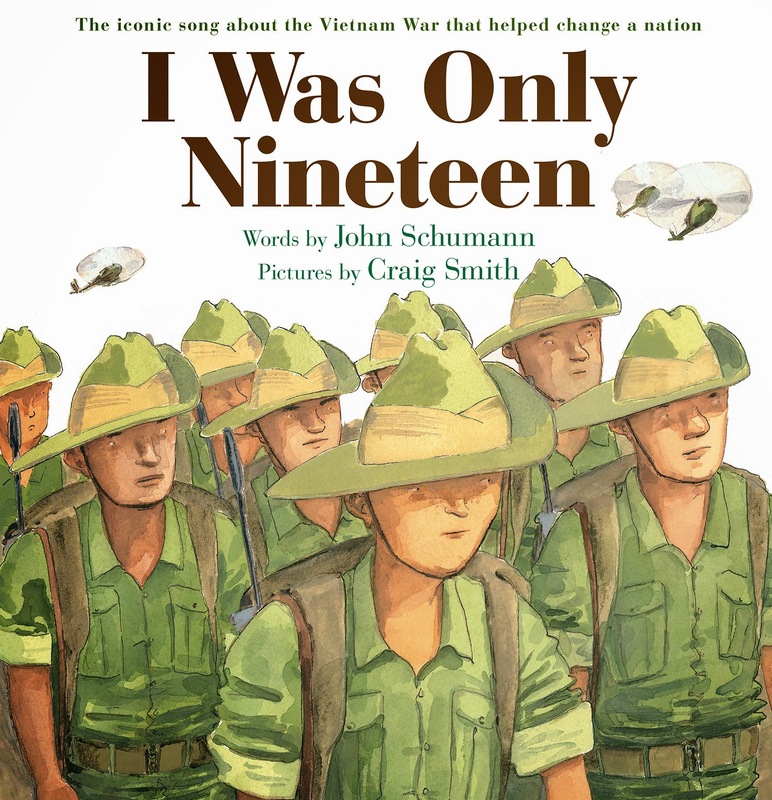 The incredibly talented Craig Smith has translated John Schumann’s marvellous and moving lyrics into a visual feast for children aged 8+, and adults that adore picture books (like me!). The answer is yes, a song can become a children’s picture book and much more. It can be a teaching tool, an historical document, an acknowledgement of sacrifice, evidence of loyalty and camaraderie, and the list goes on. Craig Smith’s illustrations of watercolour and black and white bring visual life to the lyrics as the pictures tell their own story: the leaving, the warring, and the desolation of being separated from loved ones. The pictures speak about men that left as one person and came back someone entirely different. A grandfather remembers his soldier life and retells it to his grandson. He talks about the suffering and the mateship. He recalls the fear and pain, and the loss of friends that has stayed with him always. I was part of all those scenes; I felt, and heard, and cried with soldiers, mothers and families. Craig Smith has gone to the heart of every word and has given us a valuable gift to keep along with the iconic lyrics that John Schuman became famous for. I was deeply moved by this book as will be all those open to something different in picture books.